The functions in this section are responsible for bootstrapping the boot memory allocator. It starts with the architecture specific function setup_memory() (See Section B.1.1) but all architectures cover the same basic tasks in the architecture specific function before calling the architectur independant function init_bootmem(). This is called by UMA architectures to initialise their boot memory allocator structures. This is called by NUMA architectures to initialise boot memory allocator data for a given node. Initialises the appropriate struct bootmem_data_t and inserts the node into the linked list of nodes pgdat_list. 62        * register free RAM areas explicitly. 313Just call reserve_bootmem_core()(See Section E.2.1.3). As this is for a non-NUMA architecture, the node to allocate from is the static contig_page_data node. The callgraph for these macros is shown in Figure 5.1. 337      * Whoops, we cannot satisfy the allocation request. 353      * Whoops, we cannot satisfy the allocation request. Check to see if this allocation may be merged with the page used for the previous allocation to save memory. Calculate the starting PFN to start scanning from based on the goal parameter. Test to see if this allocation may be merged with the previous allocation. 120        * Round up the beginning of the address. Once the system is started, the boot memory allocator is no longer needed so these functions are responsible for removing unnecessary boot memory allocator structures and passing the remaining pages to the normal physical page allocator. 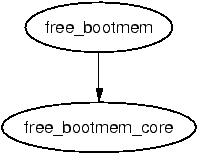 This function has two important functions, to call free_all_bootmem() (See Section E.4.4) to retire the boot memory allocator and to free all high memory pages to the buddy allocator. This function initialises the information for one page in high memory and checks to make sure that the page will not trigger a bug with some Pentium Pros. It only exists if CONFIG_HIGHMEM is specified at compile time.